We’re getting the house re-wired. Just the phones. OK, and some of the Internet cables. When we bought the house 19 years ago I swore I’d rip out the crunchy carpet in the master bedroom right away, but first things first. Our house was used when we got it. Pre-owned. By someone who I’m guessing ran a telephone soliciting enterprise out of the basement. I’ve never seen so many wires. None of them went any place, like to a phone jack. Every electrician who’s ever worked on the house has been asked to “fix anything that you’d want fixed in your own house.” You’d think that’s like handing someone a blank check. Not so. Our wiring was just too frightening. I am responsible for splitting lines with those cute little snap in connector thingies sold in office supply stores. These are just the extra ones I’m not using at the moment. I am also the one who ran the phone cord for the fax machine from one side of Debbie’s office to the other by drilling a hole in the floor, looping the “extension” cord under the heat duct in the rafters in the basement, and fishing it back up through the floor on the other side. I got pretty close to the wall when I drilled the hole up through the floor, buy hey, that’s why we have furniture. Oh, how funny! I thought I was the only one who did things like that. My mom has an ancient phone system and DishTV wanted her hooked up. I have a line going down the laundry chute from one floor to the next in order to accomplish this. The hookups for phone and internet in my house look a lot like yours. I don’t have a line in the gutter, though! I own LOTS of those little connectors, splitters, and phone lines. Oh, yikes. Makes me cringe just imagining what could’ve gone wrong. Phone cord in the rain gutter???? It might be easier to just buy a new house! 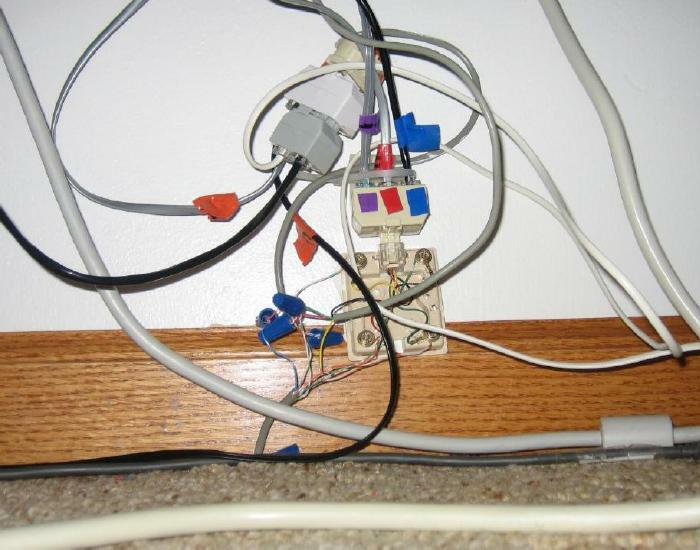 You seem to have a wiring nightmare….. You were fortunate to find a great electrician. I don’t know how you managed a business and household without an electrical fire or at the least a meltdown…….. I am glad it is now managed/organized for you. Is that what it looks like when it’s “all better? !” Yikes! Hey – maybe it was wired by the “I Don’t Care” Construction Company. Didn’t they work on your house when you first moved in? LOL Hang in there. At least you have phone service and not a tin can. Yes, this all looks familiar. (My internet lines runs above the gutter, thru the wall, over the door…well you get the idea). 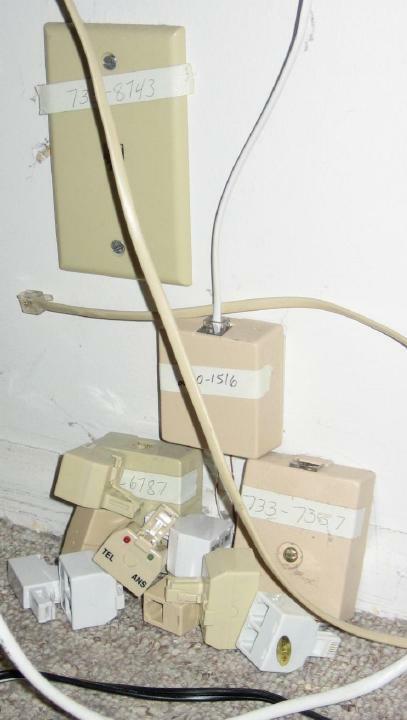 When we built our home in 1984, I personally ran all sorts of lines to BE SURE that there were plenty of plug ins, etc in every room. Even ran a phone line into the bathroom. But something happened along the way and I have power strips, line splits etc all over. It doesn’t help that I work at home and have all of that extra equipment! Thanks for the giggles (and I’m so glad you are having this “cleaned up” and “fixed”). This is so funny I had to reply. Your’s is not so bad as mine. After 20 years in the same house, 4 ingenious teenagers, 5 televisions, 4 to 6 telephones (incldunig 2 phone lines, one for dedicated line to computer), cable tv then switched to a satellite tv service, 2 computers and heaven knows how many room family occupant /swap changes through the years. I cringe whenever the telephone man has to come. I bet if the lines were stretched out from where we live would go to Brooklyn…. LOL. When will Mike, the very capable electrician from Hinterman Electric, be taking up residence in your local mental health facility? In Grand Rapids, we call it Pine Rest. It’s a lovely facility (though not inexpensive – my marketing professor told me never to use the word cheap), but he would be very happy here and I would visit him.